I was given this by the friend I had translate episode 1 back in 2013, but I never got around to posting it. He never got to episode 3 or 18, which were all I asked him to translate. So here it is, making sure it doesn't just disappear. Ah great, I wondered if another instalment might appear. I'll download this and upload it to the site once I'm back home. One thing I noticed was that in the Japanese, there was no discussion at the start of the series about Space War 3 etc. The makers of the English version just seemed to make that up on the hoof, but I wonder why. I was wondering if it would be all right for me to use this script to make a fan subtitled version of episode 2? I seriously doubt that anyone will object. Shoot BladeZ a private message. I was reading your site. I'd be very interested to see what the dialogue was in the untranslated second flashback episode. Would you be interested in me uploading the episodes and hosting them here? I'm not sure that my hosting company would be delighted with me hosting the entire series but a few episodes should be fine (for copyright reasons as opposed to space/bandwidth concerns). I have no objections. I had a friend of a friend do the translation for this back in 2012; I doubt he even remembers or cares. He did this translation along with Ep. 1, he was going to do Episode 3 and 18 as well; but that hasn't happened - guess he forgot. BTW, I saw your translation for Episode 1 before as well. Good work on it. Thanks, guys! I've now started work on timing episode 2 using your script, and I'll probably be doing some minor revisions to episode 1 as well. If you'd like to host both episodes on this site when they are complete, that would be great! I don't plan on subtitling the entire series, but might do a few more key episodes. One thing I'd really like to subtitle is that X-Bomber preview special somebody from Japan posted to YouTube. It's not that pilot thingy that is on the DVD set, which I'd kinda like to sutitle as well. That pilot is from the last disc of the Japanese 2013 DVDs. I remember that it took me a few minutes to really adjust when I found that among the extras. I think it might have been reposted from here onto YouTube. If you'd like to have this in a different format or higher quality let me know and I'll try and upload it. A subtitled version of that gets my vote as well. Is it just me or is the Japanese dialogue a bit bland compared to the English dub? I suppose all that was 'made up' by the folk that made the English localisation. Maybe that's partly why it got an unfavourable response in Japan. 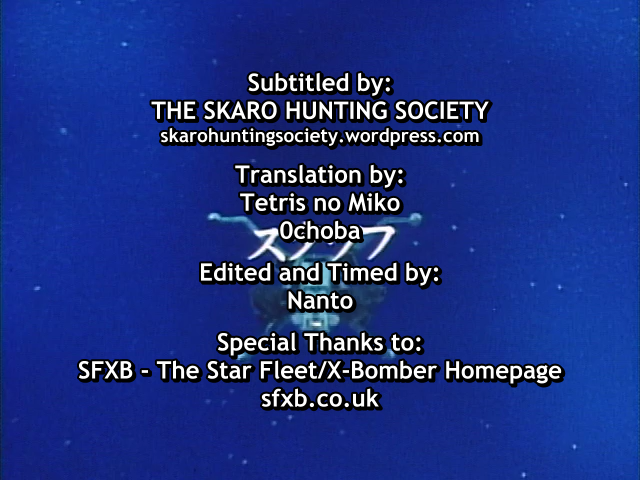 Quick question for Bladez636: does the friend who translated episode 2 have a screen name I can use for the credit screen? It seems to stream fine from the website in Edge. Feel free to use it as a mirror or whatever. I see that Nyaa has retreated into the shadows. I tried to download the client software just to see what was going on there but it then led me onto a 14 day trial for usenet, which I didn't want.